This month I'm going to try to buy nothing new unless it's an essential that I've run out of. Only thing is I always love making wish lists, so even though I'm going to restrain myself from getting any of these things in November, I still hope to get them at some point! Yarok Feed Your Ends Leave-In Conditioner (£19.00): Another Yarok product to lust over. This is a 2-in-1 leave-in conditioner and heat protection spray - both of which are currently missing from my haircare routine! I don't use heat styling very often at the moment but it would be good to have something to protect my hair when I do. May Lindstrom The Problem Solver Correcting Masque (£69.00): I've heard so many wonderful things about the entire May Lindstrom line, particularly The Problem Solver. It's an intense treatment masque to, as the name would suggest, solve your problem skin - doesn't it sound perfect?! The price tag is steep though so I think it will be a very special occasion if I get this! Benecos Nail Care Pen (£6.95): This product won the silver award for Best New Nail Innovation in the Pure Beauty Awards recently. It contains a selection of oils to help with dry nails and cuticles. Sounds like an essential for the winter months! Studio 78 We Evade Bronzing Powder in 01 White Sand (£27.00): I've been eyeing up Studio 78 products for a while now. This bronzer is said to be almost a dupe for NARS Laguna which I haven't tried myself but would be happy to jump straight in with a natural alternative instead! Heartwood Candle Co. Lemon, Lime and Wild Fragonia Candle (£18.00): My favourite NEOM Invigorate candle burnt out the other day so I want to get something to replace it. Heartwood Candle Company make 100% natural candles made from non-GM sustainable soy wax and the finest aromatherapy-grade essential oils. They recently opened their online shop and the Lemon, Lime and Wild Fragonia candle caught my attention. I love refreshing, uplifting scents so this one sounds like my kinda candle. Have you tried any of these before? What's on your wish list this month? OMG I've been searching for a natural heat protectant, you've just made my day! Have you tried the Yarok shampoo and conditioner? They're a bit pricey but I've been using both for the last month or so and I've definitely noticed an improvement in the condition of my hair. I'm going to do a full review of them once I've used them up (although I'm not even halfway through the bottle yet! ), if you're interested. I've been eyeing up that Studio 78 bronzer for ages now, it just looks so perfect! 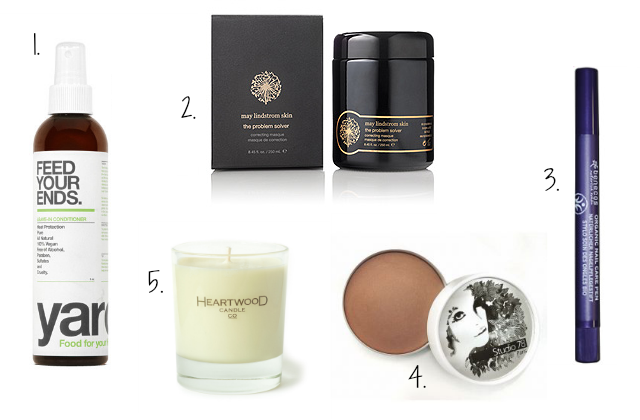 You definitely need to get a Heartwood Candle, I just love mine!